The HMF – What’s That? The HMF (Hamburger Matten Filter) is apparently not all that well known outside mainland Europe, or so I’ve been told. 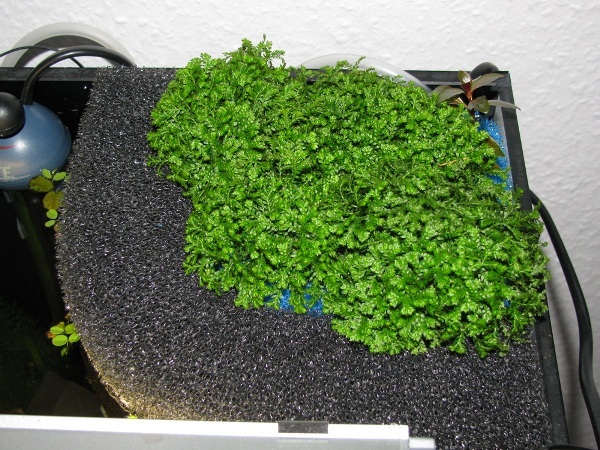 I cannot speak for the whole of Europe but in Germany it is certainly a widespread and well-loved method of filtering fish tanks and is favored especially by breeders and hobbyists who maintain a larger number of tanks in a dedicated fish room. 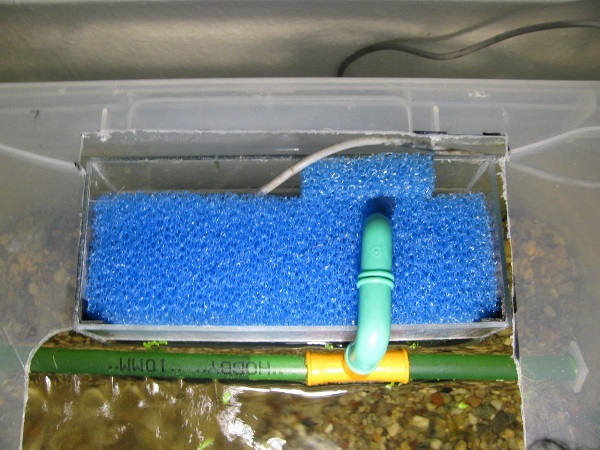 This article will only briefly touch on exactly how the filter works since that is a rather complex subject and has a lot to do with the very basics of filtration in a fish tank. There could be a separate article on that if enough people are interested. Here we concentrate on the general set-up of the HMF, its main advantages and how to build one. The history of the HMF is somewhat shrouded. Its origins are assumed to lie in the former DDR (East Germany) but there’s no confirmation of that as yet. 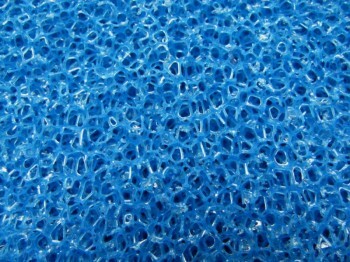 And strictly speaking, the HMF is not really an invention but rather a further development and improvement of the well-known sponge or bubble filter. 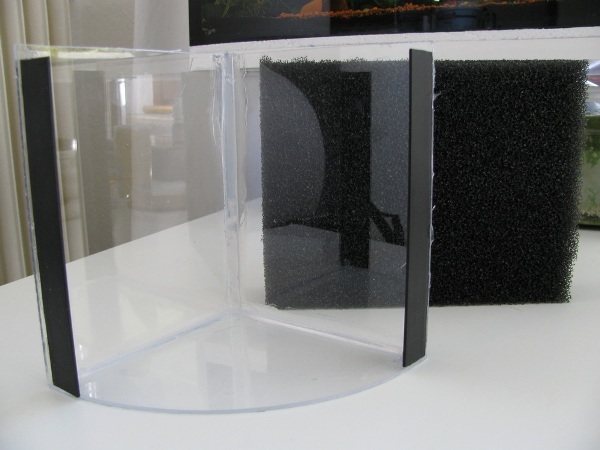 Regular sponge filters have a distinct disadvantage in that they are only suitable for smaller tanks. If you wanted to run them in anything larger than a standard 54 l, you’d need a whole array of them, which takes up space and is rather unsightly. 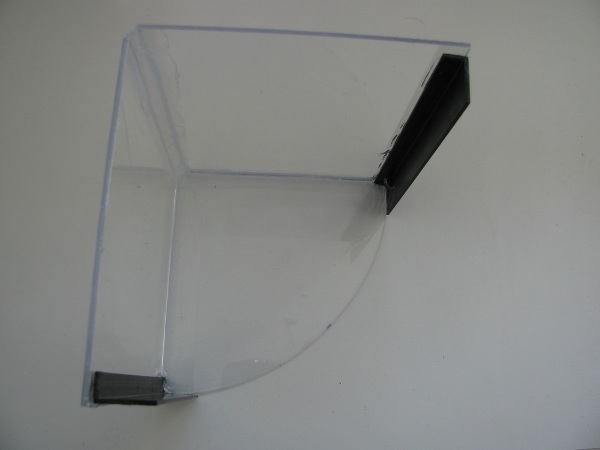 The medium of the HMF is composed of sponge sheets (‘Matten’), which should be available at either your LFS or a specialist shop for fish ponds. I have seen them in the pond section of the larger hardware stores too. The size of the pre-cut sheets usually starts at 50 x 50 cm and can go up to 100 x 200 cm. Different grades are available but for our purpose only two are really relevant. 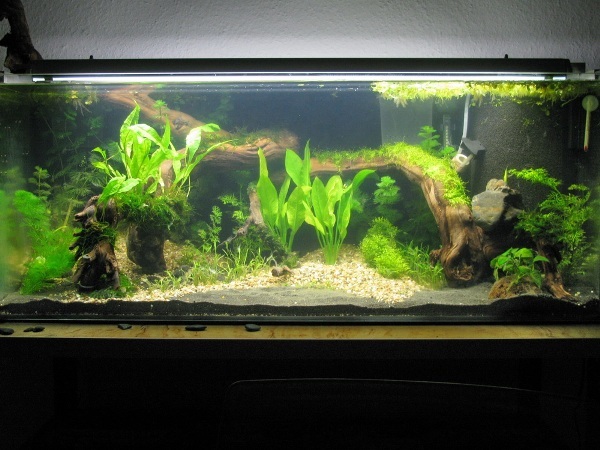 I recommend 30 ppi (pores per inch) for the general show tank and 40 ppi for a breeding tank. Anything below 30 ppi loses its mechanical filtration properties to a certain degree, resulting in suspended solids in the water column. Anything above 40 ppi clogs a lot faster and thus requires more maintenance. It comes in 10, 20, 30, 40 and 50 mm thickness of which I exclusively use the 50 mm variant. Additionally the sponge comes in two colors, black and blue, of which I personally prefer the black since it is less conspicuous in the tank (unless of course you have a blue background). But it is (for some unknown reason) more expensive than the blue variety. The HMF started out as a simple separation of the tank (front to back and top to bottom) by means of a sponge sheet, driven by an uplift tube plus diaphragm pump. The space behind the sponge needs to be just big enough to accommodate either the uplift tube or motorised pump depending on your preferences. I personally use motor pumps simply because I just cannot stand the noise of a diaphragm pump, which is needed to operate the uplift. Additionally, with the motorised pump, I know the exact capacity, i.e., how much water is moved per hour. So all four examples introduced here are based on motorised pumps as a means to transport the water. 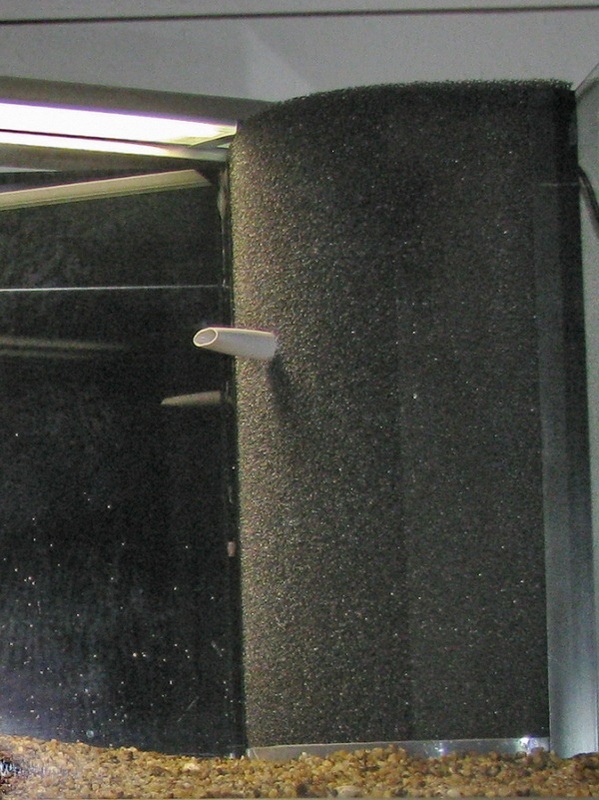 The water is pumped from the small compartment behind the sponge back into the main part of the tank. 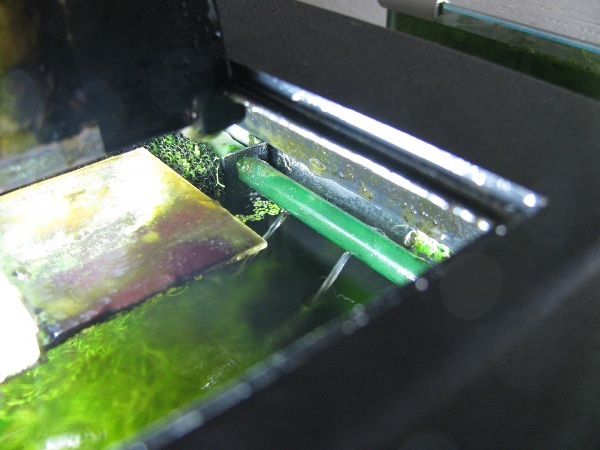 From there the water has to pass through the sponge into the pump compartment, i.e., the “filter chamber”. This basic design has two tiny disadvantages I don’t like, however. 1. when the foam starts clogging with usage (which is inevitable), it will bend towards the suction of the pump and allow unfiltered water to flow past the edges. 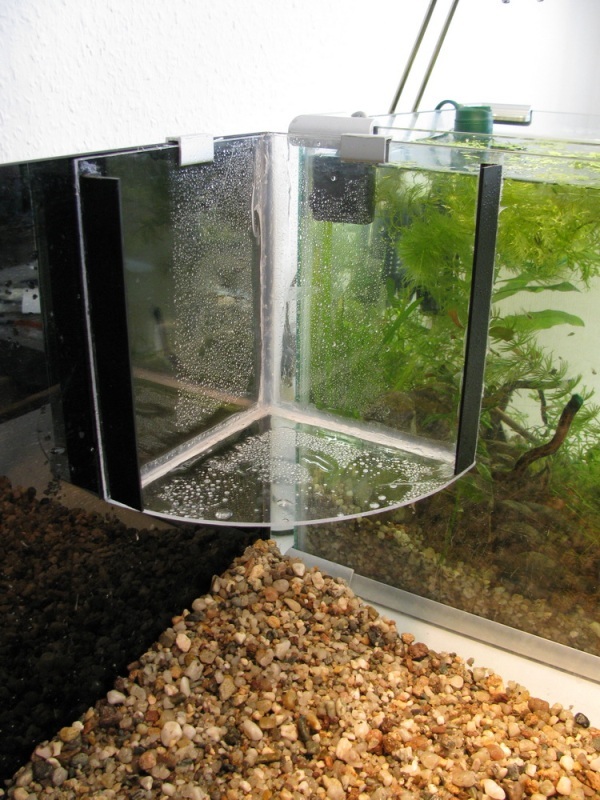 2. the filter surface area the water flows through is a given due to the tank dimensions, and one has to adjust the capacity of the pump to allow for effective biological filtration (see formula later in this article). For these reasons I prefer the “HMEF” (Hamburger Matten Eck Filter), which is nothing but a “corner variant” of the HMF. Due to the arch of the sponge it cannot be sucked inwards (given the right thickness) thus it holds its shape. So, how big must the filter be, and how do we decide the dimensions? To achieve effective biological filtration the following parameters have proven themselves as most efficient. – The water turnover should be between 2 and 3 times the tank volume per hour. – The flow-rate should be between 5 and 10 cm per minute. For our example let’s take a standard 160 l tank (100 x 40 x 40 cm) and as the golden medium a turnover of 2.5 x volume/hour and flow-rate of 7.5 cm/minute. We have a 160 l tank and 400 l/h pump, but how do we achieve the correct flow-rate? 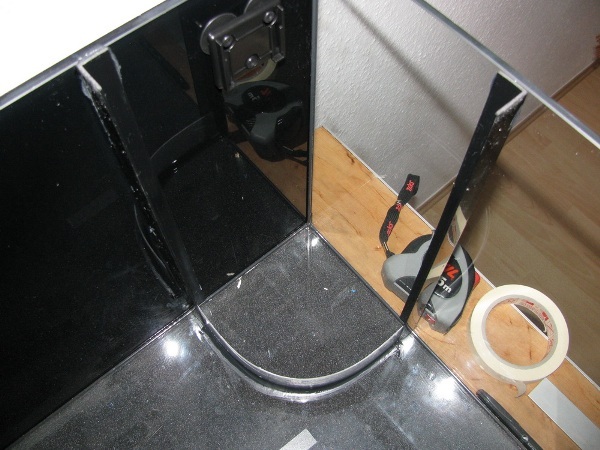 Since the height of the tank is a fixed we simply divide this result by 40 (tank height in cm) to calculate the width of the piece of sponge we need, i.e., 890 cm² / 40 cm = 22.25 cm, ≈ 22.5 cm. Therefore we cut out a piece of sponge measuring 40 x 22.5 cm. The only thing left now is to calculate where we have to silicone the PVC angle to the glass to achieve a nicely-shaped filter which is basically a quarter of a circle. r = c / 2 x π = 89 / 2 x π = 14.167899, ≈ 14.5 cm. In the tank we now measure 14.5 cm from each side of the corner where the filter is supposed to go and mark where to place the PVC angles at both the top and bottom. The rest is a piece of cake. Its biological efficacy is rivaled only by more expensive, much larger and more difficult to build filters such as fluidised beds or wet and dry trickle filters. 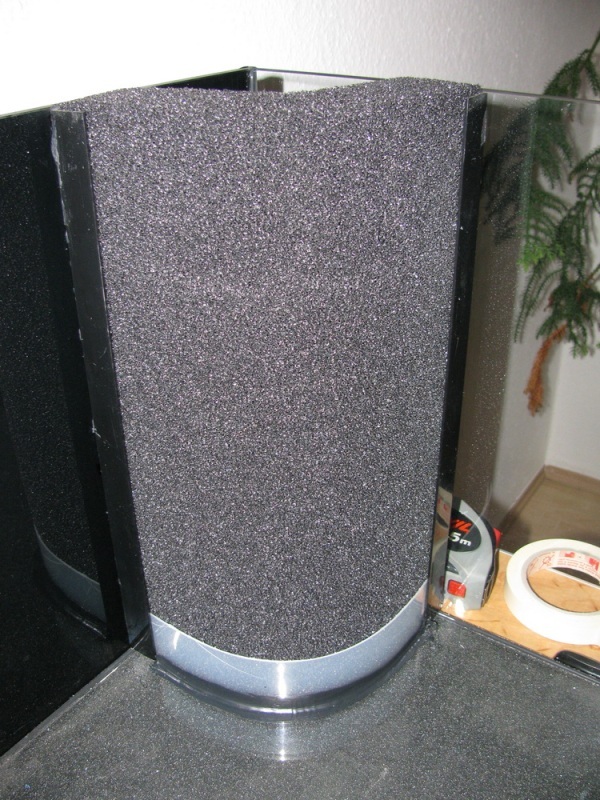 It is dirt cheap to build and operate – you don’t have to buy new filter material for years after. Very low maintenance – the one pictured above ran for more than a year with no maintenance at all before I had to clean it. When it becomes necessary to clean it, it takes about 15 minutes if that. 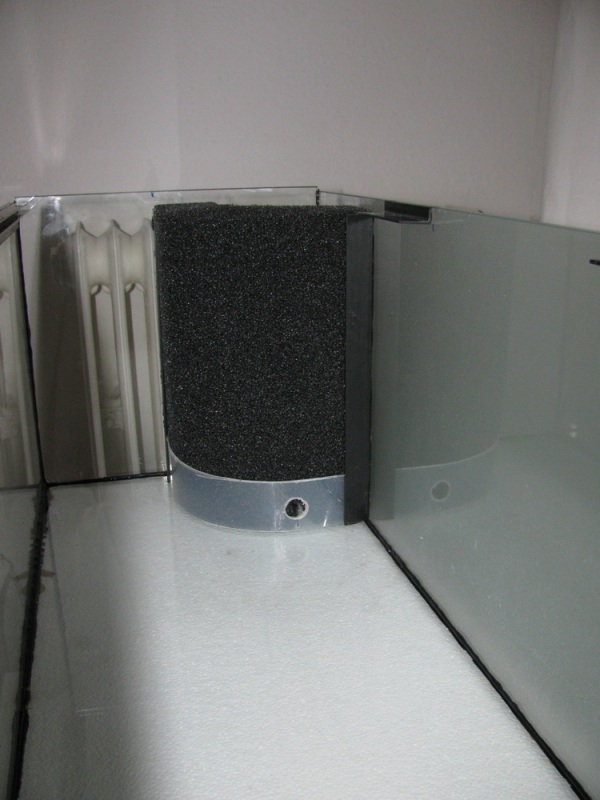 Additional equipment, e.g., heater, CO2 diffuser, etc., can be placed (hidden) in the “filter chamber”. 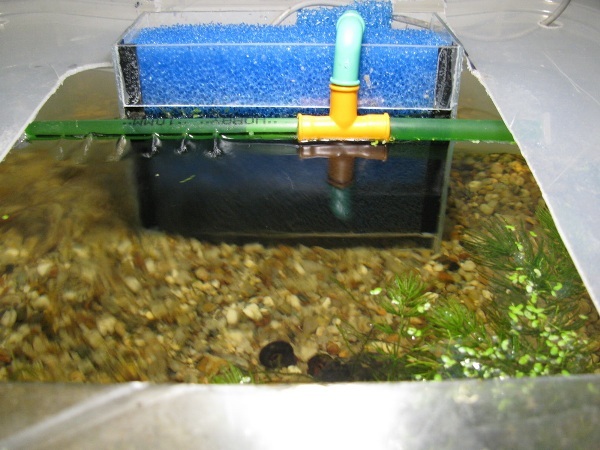 After some years of experience with the HMF, it was, is and will stay my first choice of filtration for freshwater as well as brackish aquaria. To round off this article, I’d like to show a few more examples of HMFs that I build for different purposes. 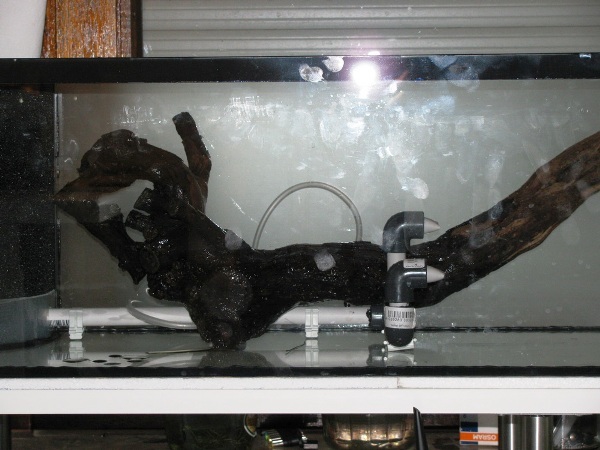 First the one I built for my 160 cm long “Asian river”. You can see that the basic set-up is the same as in the one above except for a hole at the bottom. Again you can see that the filter fits into the tank quite nicely without being too conspicuous. The picture was taken about 15 minutes after the tank was completely filled. N.B. The outflows in all 4 models cannot be driven by uplift tubes since the latter do not produce sufficient water pressure, and the outlet should be just above the water surface (yet another reason I prefer the motor pump). Filter foam is best cut with a run off the mill Stanley knife (broad blade) with new blades. Use a guide, like an aluminium angle or ruler, but don’t press down, just gently hold it in place so it can’t move. Don’t exert much pressure on the knife, just gently slide it through the material and cut in 2 or 3 passes. Olaf Deters is one of the guys who spent a lot of energy improving on the original HMF design. 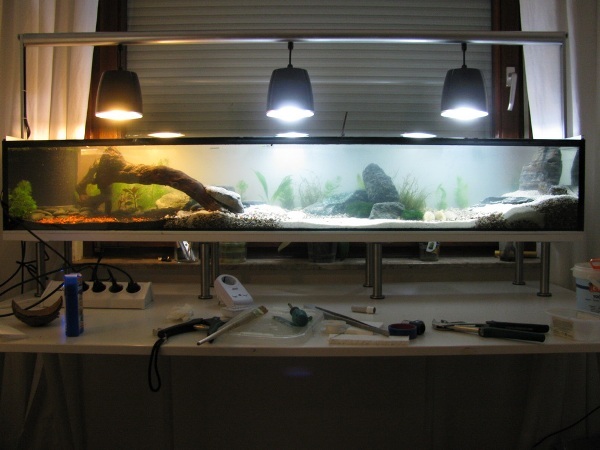 He’s a well known aquarist, specialising in killifish, and you can read his article in the German-language version of the magazine Amazonas number 44 Nov / Dec 2012 pp. 28 – 39. Concluding I would like to emphasise that I by no means have “invented” nor have been involved in the “invention” of the HMF or any part thereof. I have though, where necessary, modified it to my and, more importantly, my fishes’ needs. Amazing article! Thanks for taking the time to write it down. It’s really interesting. Fantastically detailed and well written article. Thanks Rüdiger. Great article. I have seen more and more interest in these filters recently. I love sponge filters but had considered changing to a river manifold to generate more flow so maybe I can use one of these altered manifolds to combine both! I need to say though that a lot of credit is due to Matt. He edited my at times rugged English to become this comprehensive article. Thanx again Matt. @ Catre: It’s fairly easy to do. You just need to keep in mind that an increased pump capacity requires a larger filter surface to keep the flowrate at a sensible level. If you do not want the filter to become too large, you could use a second pump outside the ” filter chamber”. If you require more info, feel free to contact me. @ Rüdiger no way I’m taking any credit for this! Thanks are all to you for contributing such a detailed and as you say yourself, comprehensive, article. @ chaudax that’s a shame, have you tried looking outside the UK? those prices can be frightening to say the least. The cheapest I’ve ever seen (and of course immediately bought) were from a dealer at one of our local, annual fish exchanges. I paid € 7.- for a sheet 100 x 50 cm, 40 ppi, black. If that is below your pain threshold let me know and I’ll try to make a contact. Shipping shouldn’t be too much since that stuff doesn’t weigh much. good to hear that you liked the article. Unfortunately I somehow lost the ‘manifold’ shot I took, showing how it looks from the front. Basically the long piece of (12 mm) pvc pipe ist oviously connected to he pump behind the filter sponge. In the tank I connected a 90° fitting to get into the right direction. To that I connected a T fitting for the first upright and then another 90° fitting for the second upright (with a short piece of pipe between each fitting). On each upright another 90° “knee” into which I ‘plugged’ the jets. I use 12 mm pvc cable conduit by the way, as it is a lot cheaper and more readily available than regular 12 mm pvc pipes. 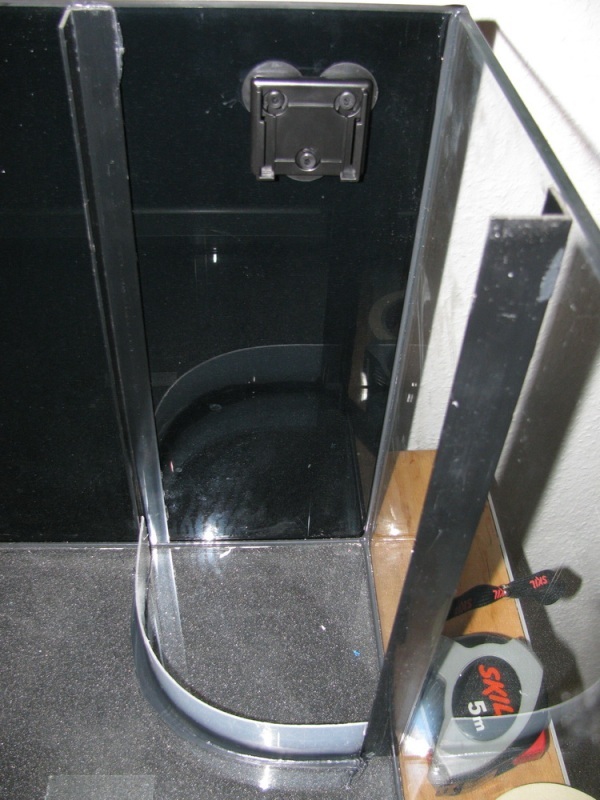 I secure the connections with aquarium safe silicone. EDIT: In this case the pipe is 16 mm not 12mm as I wrote. Shaun, did you get my mail? I’m getting funny replies to it! I did a bit of a google translation on your comment! 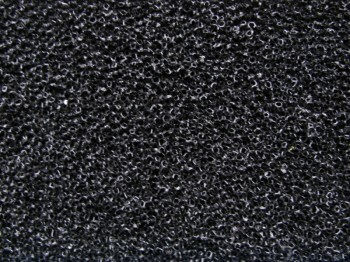 I need to make absolutely clear that the black foam does NOT contain any additional carbon! 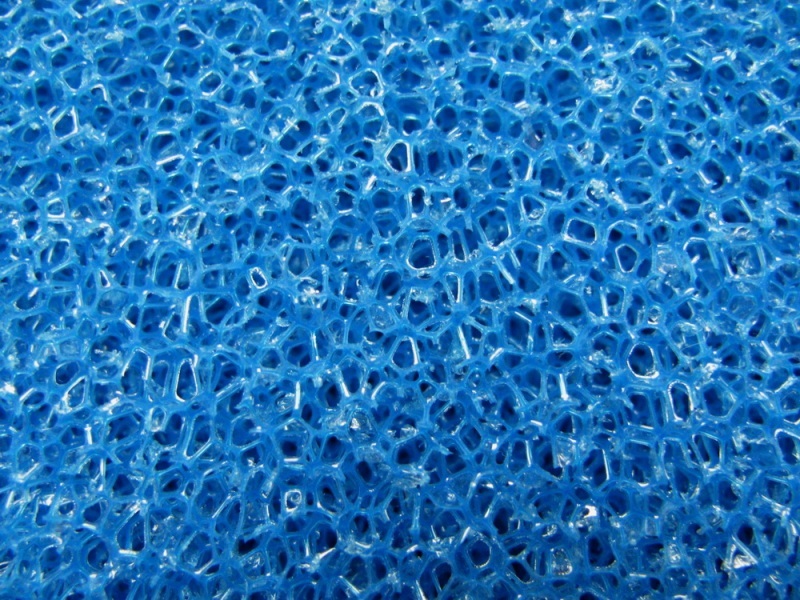 It is exactly the same innert material as the blue one just a different color. 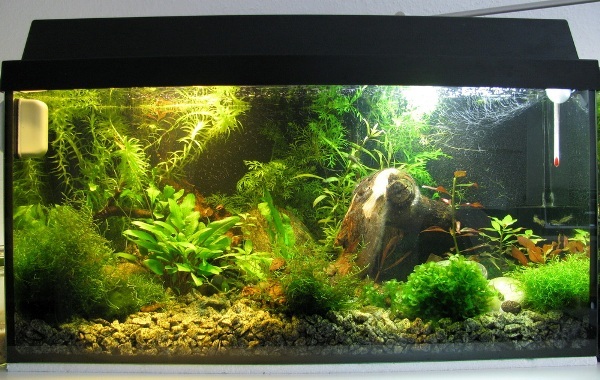 Also what is the largest size aquarium that a HMF filter could handle? What exactly do you mean by diagrams? An HMF is just a piece of foam and some means to transport the water. There is basically no limtation in size of tank. With very large tanks you could transform the whole back of the tank into a filter or install two of the corner variants. I meant just some different ways it could be built. Pictures are fine and all, but I’m a perfectionist with things like this so I lean toward diagrams more than I do pictures. No worries though,I poked around and saw some on youtube. Wikipedia had a picture(link), which just makes it as clear as can be for me. Thanks btw! I appreciate it. How would I calculate the flow rate if I wanted to change the amount of water turnover? Say I wanted to filter all the water in the tank between 4 and 6 times per hour. How would I calculate the needed flow rate to accomplish this? I just realized that I asked a question without remembering to say that I think this is an excellent article: easy to understand, well written, informative. I’m looking forward to trying this filter on my own tank. Thank you for posting this article. The water turnover in your tank is determined by the capacity of your pump. Unfortunately, you don’t tell us the volume of your tank, so I’ll take a 160 liter tank as an example. To achiece a 6x turnover, you’ll need a pump with a capacty of roughly 1000 l/h (6x 160=960) It is only now that the important calculations start. As I mentioned in the article, the flow rate to aim for is between 5 and 10 cm/min. Let’s take 7.5 cm/min for our example. That gives us a surface area of 2133 sq cm for the filter sponge. 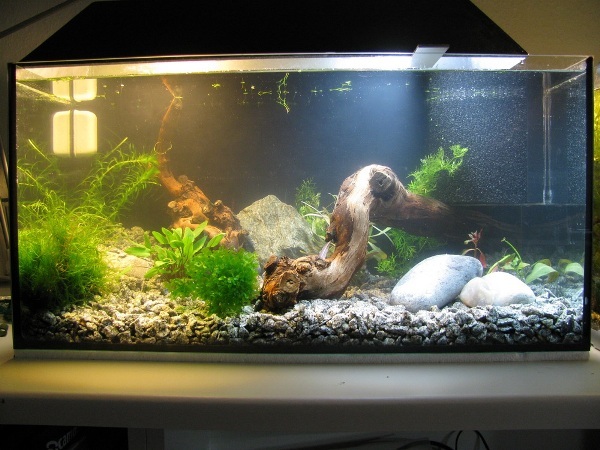 In a standard 160 l tank, the hight is 40 cm. We now divide the area by that hight to get to the width of the sponge. 2133 / 40 = 53.3. So the piece of sponge needed is 53 x 40 cm. If you want to have a corner HMF, you have to calculate the radius i.e. where to put the fix points for the sponge. 53 x 4 = 212 / (2 x pi) = approx. 33.5 cm! You just have to exchange the 160 of this example with the actual volume of you tank, and the 40 with the actual hight! I hope this was of help to you. If you have any trouble, just P.M. me the details of your tank smd I’ll be glad to help. 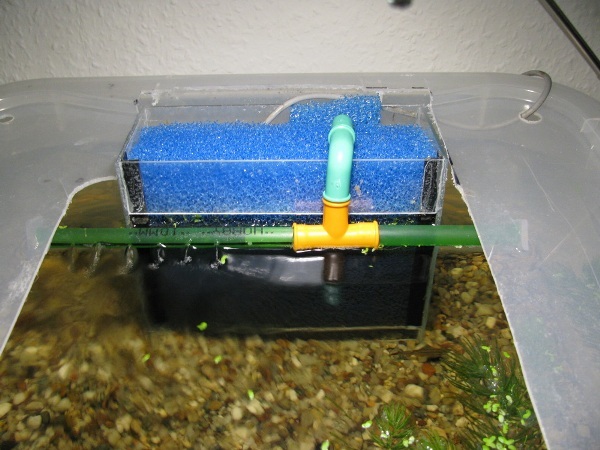 Really great writeup – I too use only the HMF filters with an AL40 airpump and it works very well in tanks from 10 to 150 gallons (for the 5 gal tanks I use the 4×4 cubes. 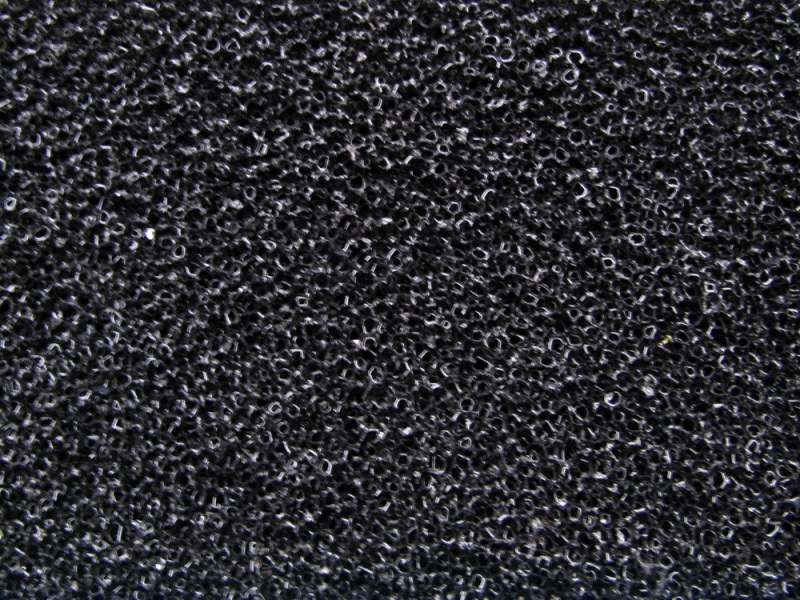 Our US supplier for the Poret foam filter materials is Stephan Tanner – Swiss Tropicals (swisstropicals.com) and he has lots of detailed information on construction, flow and biofiltration to complement your answer here. Thanks for the article …. I will give this a shot in my new aquarium. Thank you, a very helpful article and guide. The links were helpful too. The only issue I have is finding the filter sponge! I have tried normal aquarium shops but the prices were just too high; so much so that you are better off buying two regular canister filters! Can you advise on any general hardware stores that may sell this? For example, could I fins this in a “Bauhaus” chain store? I just came across this article in my search for information about HMFs! What a wonderful article! I was wondering if you would be able to share what type of motorized pump you use, in place of the uplift?